Why do I get disconnected before I finish composing my message? Many web services have inactivity time outs that will log you out after a while. I'll look at why, how, and why typing might not count as activity. My wife has a Lenovo laptop with Cox as provider. As she finishes a long email, not typing too fast, the screen goes blank, with the comment she was disconnected losing the email message she was writing. How can the "writing" time be extended, before the disconnect note? In general, the "writing time", as you call it, cannot be extended. That's set by the service you're using. I'll explain why it exists, how it works, and why it's a good thing ... really. And of course, I'll suggest a way to work around it. What I believe you're seeing is called an "inactivity timeout". Whatever service you're using hasn't seen any activity on your part for some period of time, so they assume you've left the site or service or otherwise walked away. So they log you out or disconnect you.
" I frequently compose lengthier emails in my text editor, and only when I'm done do I copy it into my mail." So that if, in fact, you did walk away and leave your computer someone else couldn't walk up and start using your email, or bank, or whatever service you had been using. It's a security measure, pure and simple, meant to protect you from someone else accessing your account after you've left your computer. It's a good thing - honest. It's actually very common to be called away from your computer and leave it without taking the time to close down or log out. If there's someone else around, you don't want them to be able to access your information. So, after a while of not seeing you do anything, the service takes steps to prevent it. Yes, you were. You were typing. But ... the service doesn't know that. When you're typing up your message that's all just happening on your local computer. It's not until you hit Save or Send or something similar that the information is actually sent to the service. If all you're doing is typing up a message, the server isn't involved - it thinks you're doing nothing. It thinks you're inactive. And as such that "inactivity timer" clock is running. I can think of several ways to improve how this works - my bank, for example, doesn't just log me out, it pops a warning asking, in essence "are you still there?". If I don't respond to that in a few seconds then it knows I'm not and logs me out. But many web-based services - typically email and forum software - work exactly as you describe. Type quickly or you're out. Use a text editor of some sort - notepad, or maybe Word if you turn off all its auto-replace features - basically any program that you can run on your computer into which you can type text. When your message is done, select it all in your editing program, copy it to the clipboard, switch to your mail (or wherever you were having the issue), get to the point of where you would type in your message and paste it in from the clipboard instead. Send or Post your message. Delete or archive the document that you were "Save"ing above as you see fit. I do this a lot. I frequently compose lengthier emails in my text editor, and only when I'm done do I copy it into my mail. Another approach if you're experiencing this problem with email specifically is to use a desktop email program instead of web-based email. It's the web sites that enforce these kinds of time-outs. If you instead use a desktop email program to manage and send email, no such time out applies. Though you'll want to hit "save" every so often anyway (typically this causes the message to be saved in a "draft" folder), just in case. My desktop PC shuts off after a period of inactivity. Why? Computers can be configured to shut down after periods of inactivity. But if it happens without having configured it, reasons aren't as clear. What are the pros and cons of web-based email over desktop email? Web based and downloaded email both have significant advantages, and disadvantages, to managing email. Which is right for you depends on many things. 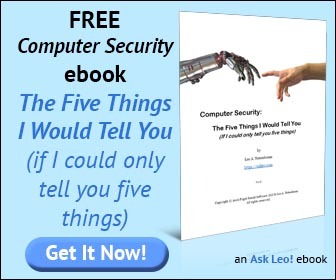 Leo's solution is also what I often do (using a simple text editor such as Notepad). For the FireFox browser you can obtain (free) an add-on called Lazarus that remembers what you type into web pages and enables you to recall it if the web page suddenly disappears (e.g. in an inactivity timeout or if you accidentally close the page). Along these same lines, I use Outlook which in turn uses Word for outgoing messages. Often when typing a reply, I am typing along with no problems and happen to use a "b" in a word and the typing jumps to a completely unrelated word perhaps a page down. Some other letters will cause the Word program to exit completely and go back to Windows or IE. Do you have any thoughts on why this could happen. Should I change email editors and use "notepad" or "word pad" as email editor? Very strange. Most likely to happen when I am replying to an email rather than initiating a new email. I'm a little surprised to find that links in your article and in comments, which I thought would give additional definitions or information, link to advertisements. Somehow, that doesn't seem quite right. There are little free programs out there that tickle the internet every minute or so. These will prevent what I happening to you. Back in the olden days, just about everyone who had dial-up connections needed them. ISPs would only allow about a 5 minute lapse in activity to disconnect us. One such program is Stay Alive . I've found that using a free enhanced composition application called "Jarte" offers much the same advantage as any of the major word like programs and loads very much faster and has every feature that you might care to want for composition, as a place to create or even park boilerplate phrases that you may wish to assemble for specific message use..
Just go the jarte.com for a review and access to this free application. While this does not prevent the Internet service you use from ending your session, it MAY do so if you follow Leo's advice of frequently saving your work as you create it, particularly if it is a lengthy session. I have tried using Word - or even composing in Outlook and copying to the web based mail program. But it didn't go well... the person replied back and I could not BELIEVE what "my portion" looked like. The text was not the same... what I saw and what they received was different. It was embarrassing... Now I compose in the web based email program (or forum, as this can happen there as well) and use "copy" after each paragraph, just in case of timeout. novice wife understand it is not fully her fault, nor the laptop which annoys her at times like that to throw it into the basket!. Yes, I do affected the same kind of issues and solved like what Leo said. But sometimes I could see some browsers will not allow you to copy and paste. Those cases you have to enter on screen, still dont know what the solution is and I solve by typing fast and making message shorter. Some people consider the "correct" way to use email is to type a letter in Microsoft Word or some similar program, then add the complete letter as an attachment to your email. I see this often in the place where I work, especially when its a long memo. The body of the email only serves to confirm that there's an attachment or link to be clicked. I know some people are absolutely paranoid about clicking any attachment or link in their email, but that's what I do all day long. We get Word, Excel, PowerPoint, PDF and others, as well as links to information. Sometimes these people are known, other times they are new suppliers or customers.